"Measures which the United States Government Might Take in Support of a Successor Government to Mosadeq", a revealing, top secret internal document from 1953, outlined strategies for supporting a compliant coup government in Iran assuming Prime Minister Mossadegh were to be vanquished. Though the National Archives and Records Administration (NARA) declassified this highly provocative, undated “what if” memo on July 9, 1991,3 it has remained virtually ignored by academics. One major reason, most likely, is that the extremely fuzzy photocopied document NARA released is damn near illegible—few would be motivated enough to endure the retinal torture of reading it. This exclusive transcript and examination by the Mossadegh Project is intended to remedy that. Functioning as a guide on what to do next if the U.S. got its wish and Mossadegh was smushed, the memo suggested public and private applications of various economic, military, diplomatic and psychological tactics. As for Iranian relations with the Soviet Union, the memorandum predicted (not very accurately) that the USSR would be hostile to the coup regime and provide clandestine support to the Tudeh party, which would carry a torch for Mossadegh. It added that Mossadegh would “automatically become a Tudeh martyr”, yet to discredit their cause, also wanted Iranians to be reminded that the opportunistic Communists had previously attacked him for being an “imperialist agent”. Had Operation Ajax not succeeded, this memo would have been relatively worthless, so it’s worth comparing its recommendations with how the U.S. actually did engage the regime following the coup. In that light, one things stands out – the immodest, open manner in which the Eisenhower administration embraced the Shah, in direct defiance of its admonition to “[conceal] the foreign hand to the maximum extent possible”. The very week of the coup, Eisenhower’s cheerful message of congratulations to the Shah was released to the media, and no secret was made of the swift economic aid to Iran, previously denied—also quite publicly—to Mossadegh only weeks earlier. In speeches to Americans, Eisenhower complimented the Shah and trashed Mossadegh, Secretary of State John Foster Dulles issued his own endorsement of the Shah-Zahedi government in October, and by December, Vice President Richard Nixon flew to Iran to greet the new regime. In 1953, 1954 and beyond, the Shah and his Queen were frequent guests of honor at the White House and made regular visits to America – champion of democracy, defender of freedom, and unapologetic patron of the young king of Iran. 1 Cited in Overthrow of Premier Mossadeq of Iran (1954) by CIA agent Donald Newton Wilber. 2 Stutesman — June 12, 1988 interview, Columbia University oral history program and the Foundation of Iranian Studies. 3 The handwritten date appears to be either 1991 or 1997—it’s impossible to tell. • Though technically undated, “March 1953” is scrawled in pencil at the top of the document. • An appendix with financial figures on the state of the economy is referenced in section III, but missing. • The document ends with the abbreviated names of John H. Stutesman and R. Bernard Crowl, both of GTI. • A heavily excised internal CIA history, "“Zendebad, Shah”! : The Central Intelligence Agency and the Fall of Iranian Prime Minister Mohammed Mossadeq, August 1953" (1988), offers a paragraph summary of the document. Assumption – a coup against Mosadeq has firmly established a successor government we wish to support. Problem – what measures might the United States Government take to support the successor government? 1. It would be literally fatal to any non-communist successor to Mosadeq if the Iranian public gained an impression that the new premier was a “foreign tool”. The U.S. Government should confine any comment upon a change in government in Iran to repetition of our traditional unwillingness to interfere in the internal affairs of a free country and our willingness to work with the government in power. The U.K. Government should give no indication that it considers a successor to Mosadeq to be ready to serve U.K. interests or that the British had a hand in bringing him to power. Naturally, there should be no expression of regret that Mosadeq has departed from the political scene. 2. The U.S. Government should avoid any statement that the oil question is involved in a change of government in Iran. It is important that neither the U.S. nor U.K. Governments should rejoice publicly over expectations of a more reasonable Iranian attitude towards solution of the oil problem. 3. To show that the U.S. is not antagonistic to the successor government, an official comment could be made that we are, as always, interested in helping any free country to build its strength against communist subversion and will work with the present government of Iran to that end, if so requested by the Iranians. 4. It is important that U.S. Embassy officials be most circumspect in initial contacts with members of a new Iranian Government. 5. A visit to Tehran by the Secretary of State, should he be passing through the Middle East at a time when a new Iranian Government has become firmly established, would have important effects and he might wish to consider such a visit in the light of the situation existing at the time. 1. 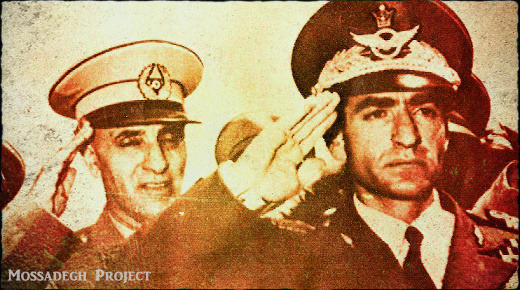 Concealing the foreign hand to the maximum extent possible, both the Shah and the successor to Mosadeq should be informed at an early date that the U.S. is eager to assist in any way feasible the success of the new government. 2. Both the Shah and the new premier should be informed through private non-American channels that the U.S. and U.K. realize that for the new government to raise the question of an oil settlement before it is firmly established is far too dangerous a matter to be considered. Naturally, private assurances that the oil dispute will be settled on reasonable terms maybe sought, but it would be disastrous for a new government to be forced immediately and publicly to attend to the oil dispute which engenders such fanatic emotions in Iran. 3. Recognizing the importance of a propaganda machine supporting the new government and repressing opposition, the U.S. might covertly assist in subsidizing some pro-government newspapers and could openly make radio equipment and technical advice available to a new government’s effective operation of Radio Tehran. 1. Any ostentatious increase in U.S. military aid to a new Iranian Government would be likely to create public antagonism in Iran both to the U.S. and the new government, since Iranians are so sensitive to fears that their country is being prepared to serve as a foreign military base. Certainly any displays of foreign armed might, such as a visit by foreign naval force or flights of foreign aircraft, would be disastrous to the establishment of a new government. 2. In consultation with a new government, arrangements might be made for the U.S. Government to pay the costs of U.S. military advisery missions presently representing a financial burden to the Iranian Government. 1. Privately the new government could be assured of U.S. willingness to provide military aid to any reasonable extent desired. A particular point might be made of providing military items such as trucks and communication equipment which have civilian uses. 2. Since it is quite likely that a coup against the Mosadeq government will result in serious urban disturbances and possibly outbreaks resembling civil war in the provinces, the new government will probably face an initial problem of restoring order. Riot-quelling weapons, small arms, and money should be available in case the U.S. Government desires to furnish such equipment clandestinely to any Iranian forces. 1. Budgetary support will be an important and immediate need of any successor to Mosadeq. At first, foreign budgetary aid should be given as privately as possible without requiring public agreements or commitments on the part of a newly running government. A covert operation might meet this problem for the first month particularly in payment of security forces, a maximum figure (based on last year’s Iranian budget) of $5 million a month. Grant budgetary aid should not be forced upon a new Iranian Government with requirements for formal commitments or acceptance of a large community of Americans to supervise disbursements. Appendix I describes in detail Iran’s yearly budgetary deficit ($45 million if the NIOC sells enough oil to cover its own expenses). A basic assumption to this estimate is that a new government will not be in a position to continue clandestine printing of new currency. 2. Note cover is an explosive political problem in Iran. Mosadeq has officially denied the fact known to the Embassy that his Government has printed 1.5 billion rials illegally. A new government, exposing this fact, could brand Mosadeq as a liar and malefactor. It would not be difficult in Iran to add a rumor that Mosadeq and his associates have profited personally from the illegal and secretive expansion of the note issue. Such an exposure might, however, create panic in Iranian financial circles and would effectively prevent the new government from taking Mosadeq’s course of inflationary financing. A public offer by the U.S. Government to cover the illegally expanded Iranian note issue would have a dramatic and extremely useful political, financial and psychological impact in Iran. (This would involve about $30 million). Perhaps no other move could so effectively and immediately demonstrate U.S. support of the new government. It would allow full play of the new government’s propaganda to show up Mosadeq as a liar, cheat and thief. It is a step which would require no expenditure of money by the Iranians and no foreign supervision of disposition of the funds. At the same time, in the peculiar atmosphere of Iran, it would be considered an important and beneficial type of foreign aid. Privately, in this maneuver, it might be agreed that the gold offered by the U.S. Government would remain in the U.S. as backing for Iranian currency to be used at some appropriate later date for economic development in Iran, since 100 percent backing of Iran’s currency is not a physical necessity. 3. Land-Lease and Surplus Property deliveries to Iran created a debt of nearly $30 million. It is obvious that the Iranians cannot pay this without oil income and they were serious question as to their intentions over to pay. A gesture of goodwill towards a new government could include an announcement that Iran’s debt would be written off either completely or perhaps against some expenditures in Iran, i.e. economic development, student exchange, etc. 4. Trade, except for oil exports, naturally moves from Iran toward the Soviet bloc. This movement is accelerated when non-Communist nations are unable to offer equivalent trade opportunities. For example, the communist system of state trade permits the conclusion of trade arrangements for political rather than commercial reasons and also permits barter trade which meets Iran’s foreign exchange problems. Both the Japanese and the Germans can have profitable and voluminous trade relations with Iran. This trade could also be on barter basis. The establishment of German and Japanese diplomatic and economic missions in Iran would help a great deal in this regard. Further encouragement for trade between Iran and other Western nations, including the US, might result from a minimum of temporary technical and financial assistance. For example, a market for caviar might be found in the U.S. if this government were prepared to make a small investment to get it started. 5. Oil income is normally the largest source of revenue for Iran. Although the oil dispute should not be thrust upon the new government in its infancy, the British might be encouraged to allow certain measures to be taken to keep the Iranian oil industry in some minimum operation on the presumption that the new Iranian Government would reach some mutually satisfactory settlement of the dispute with the British. 6. TCA. Present plans call for reducing the TCA Program [Technical Cooperation Administration] in Iran to $14 million in new funds. The present level of expenditures, which involves both FI ‘52 and FI ‘53 appropriations, is about $5 million a month or $35 million a year. TCA hopes that its reduced program will be supplemented by additional material aid in an amount sufficient to bring the ‘54 program up to the current level of expenditures. If the Point Four Program were reduced without additional material aid at a time when a new government is a struggling for position in Iran, it would be considered evidence of U.S. disinterest which might not only weaken the new government but could quite possibly lead to the cancellation of the plane for agreement expulsion of that source of U.S. influence. 7. Economic development. Any new government of Iran must lay claim to a program to develop the country economically. To support such a program the U.S. should be in a position to offer immediately at least $15 million to help the Iranians complete same or other projects of a long list of worthy subjects developed by Americans and other advisers since the War. Appendix II describes three separate irrigation projects, which together could be developed with $45 million over a three-year period. The Export-Import Bank has long had earmarked a $25 million loan for economic development in Iran, and it is probable that this loan could be advanced quickly with Departmental encouragement. It must be frankly admitted, however, that Iran’s ability to repay any such loan or provide the rial cost of the projects involved without oil income is limited. Iranian Airways. The Iranian Airways which at present is faltering for lack of money and equipment and which is dominated by a known Soviet agent could be restored to effective operation by a U.S. private concern supported unobtrusively by the U.S. Government. 1. Any British statements welcoming a successor to Mosadeq or otherwise indicating that the successor will serve U.K. interests, will probably serve as death warrants for the new premier. 2. If the U.K. restricts U.S. action vis-à-vis a new Iranian Government on the plea that the oil dispute must first be settled on terms satisfactory to the British, the problem of supporting a new government will become almost insurmountable. 3. Neither the U.S. nor the U.K. can hope to obtain public economic concessions or political rights in Iran, and this fact should be mutually understood between the U.S. and U.K. before embarking upon any adventures in internal Iranian politics. 1. The Soviets would undoubtedly use all means at their disposal to oppose any government which promised to rule Iran with a firmer hand than Mosadeq had used. The latter’s opposition has constantly accused him of softness toward the Tudeh, which organization has recently devoted much effort to explaining to its members why Mosadeq should be supported in his feud with the Shah, obviously fearing severe restrictive measures against it should a new Prime Minister appear. 2. Once he was out of office, Mosadeq would automatically become a Tudeh martyr and the party would automatically throw its full weight behind those elements seeking his restoration. Should Mosadeq himself disappear from the scene, the Tudeh could conceivably seize control of the nationalist movement in his name and make a concerted drive to seize power for itself. 3. It is to be expected that Soviet agents would actively aid the Tudeh, including furnishing of arms clandestinely, but that Russian armed forces would not enter Iran because of the danger of a resultant all-out war. For the same reason Western forces could not be used on Iranian soil to aid the new government without running the danger that the Soviets would then invoke the 1921 treaty allowing for the introduction of Soviet troops into Iran under certain conditions. That these conditions as stipulated would not exist, but obviously not deter Soviet notion. 4. Aside from providing covert assistance to government forces, the U.S. approach would consist of a vigorous propaganda offensive pointing up a) the well-known and easily documented Russian orientation of Tudeh policy, b) the ways in which the Russians lend assistance to Tudeh, and c) the complete opportunism of communist policy as evidenced by its former violent attacks on Mosadeq as an imperialist agent.